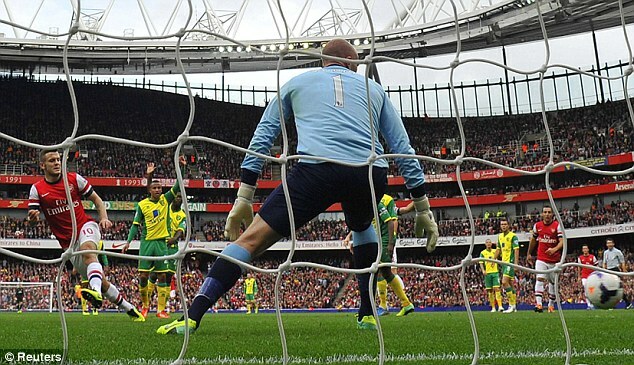 In the pantheon of great goals, Arsenal already have a couple of entries – most notably a sublime effort by Dennis Bergkamp against Newcastle in 2002, when the Dutchman flicked the ball around a defender then calmly slotted into the net – but last weekend they added another when Jack Wilshere completed a fantastic team move to open the scoring against Norwich City. The smoking English midfielder was involved in the build up play as well as adding the finish, but the interchange between Wilshere, Olivier Giroud and Santi Cazorla was simply amazing, involving flicks and intricate passes – making everyone who witnessed it unable to do anything other than applaud. As a die-hard Tottenham fan, those last few sentences were hard to write, so let me at least balance my praise of the old enemy with examples of other equally impressive goals: last weekend, there was Paris Saint Germain’s first and third – scored by the backheel of Zlatan Ibrahimovic and a mazy run from Edison Cavani respectively – in their 4-0 win over Bastia; and for a team effort, Argentina’s famous 25 pass move against Serbia in the 2006 World Cup, which still ranks as my favorite non-spurs goal of all time. (My top Tottenham strike? Thanks for asking! David Ginola vs Barnsley in the 1999 FA Cup). The quality of the opening goal from Arsenal was not wasted either, as they went on to beat Norwich 4-1 – with two of the other three strike coming from their big summer signing, Mesut Özil – and they cemented their place at the top of the Premiership, opening up a two point gap over both Liverpool and Chelsea. The Blues moved into second place after beating Swansea by the same 4-1 scoreline the Gunners achieved, but their first was controversial as Samuel Eto’o kicked the ball away from Cardiff goalkeeper, David Marshall, while he was bouncing it, something that is not allowed under the rules and a free-kick should have been awarded. Instead, the Cameroonian was able to set up Eden Hazard for a simple equalizer – canceling out Jordon Mutch’s opener for the Welsh side – and Jose Mourinho’s men broke through in the second half, scoring three times including a first Premiership goal for Eto’o. The three points moved Chelsea above Liverpool in the table on goal difference, as the Reds were held to a 2-2 draw by 10 man Newcastle in the early kick off on Saturday. Newcastle had taken the lead through a long-range strike by Yohan Cabaye, but shortly before half-time they had Mapou Yanga-Mbwia sent off for a tug on Luis Suarez in the area – which was actually no more than a light pull on the shoulder, but the Uruguayan striker could not have made more of a meal of it if he had set out some candles and poured some wine. From the resulting spot-kick, Steven Gerrard notched his 100th Premiership goal for Liverpool, but despite their numerical advantage, the visitors found themselves behind again after 56 minutes when Paul Dummett sneaked in at the back post to convert a Cabaye free-kick. The Reds could not be denied a point however, and they gained it when a Suarez cross found Daniel Sturridge’s head to give the England striker his league-leading seventh Premiership goal of the season. Just behind Sturridge in the Premiership scoring charts is Sergio Aguero, who took his tally for the season to six with a brace in Manchester City’s 3-1 away win against West Ham, with David Silva netting the third for the visitors to end any hope of a comeback the Hammers might have had following Ricardo Vaz Te’s overhead kick that had reduced the deficit to one midway through the second half. That victory propelled City up to fourth in the table, usurping Southampton who still earned a credible draw at Old Trafford through a late equalizer from Adam Lallana, a result which increases the pressure on David Moyes, who has only won three of his first eight Premiership matches in charge of Manchester United. The Red Devils are languishing in 8th place in the early table, eight points behind Arsenal and four behind the teams directly above them: Southampton; and Everton, who earned a 2-1 home victory over Hull last weekend, with Steven Pienaar returning from an injury layoff to grab the second half winner. There were two more great goals – scored by Fulham’s Patjim Kasami and Steve Sidwell – on Monday night, as the Cottagers came from behind to beat Crystal Palace 4-1, the final fixture in charge of the Eagles for Ian Holloway, who left the club by mutual consent during the week. Sunderland – who are the only other Premiership club to have changed their manager so far this season, with Gus Poyet now in the dugout – showed no signs of improvement as they were beaten 4-0 by Swansea in South Wales; while all of those goals were averaged out by the unsurprising scoreline of Stoke 0 – 0 West Brom, a game which I saw, read and heard nothing about, which is probably a good thing, so why change it. Of course, there was one other fixture in the Premiership last weekend, Tottenham’s visit to Aston Villa last Sunday, which saw Andre Villas-Boas’ men bounce back from their previous reverse against West Ham to beat a different team in claret and blue, 2-0. It is really hard as a fan to work out how I feel about Spurs so far this season – the three points against Villa were not exactly undeserved, but they also seemed to be in doubt for much of the game, as chances were wasted and possession squandered every time we moved forward. Up front, Roberto Soldado again was working hard but seemed unlikely to trouble the scoring charts as he was rarely in or around the penalty area and our opening goal was a fortuitous strike from Andros Townsend that sneaked its way into the far corner after Lewis Holtby had ducked underneath it. When Christian Benteke was brought on an hour into the game by the home side, it appeared to be the catalyst for the obvious capitulation, as Tottenham were suddenly on the back foot and Villa looked favorites to score the next goal. However, within a flash it was 2-0, as Soldado chased down a defender, got the ball out to Holtby, who played it to Paulinho and the Brazilian played Soldado in for a simple finish and his first goal from open play in the Premiership and ended the match as a contest. If I could look at the facts about Spurs’ season thus far with my head rather than my heart, then it would be impossible not to be encouraged: 11 wins from 14 games in all competitions; 11 clean sheets in those contests; fifth in the table, only three points behind Arsenal in first; and enough depth in the squad to be able to compete on four fronts this season (Premiership, Europa League, League Cup and, come January, the FA Cup). Nevertheless, the three matches that Tottenham have failed to emerge victorious from were the ones that fans put the biggest emphasis on – against London rivals Arsenal, Chelsea and West Ham – so much as Thursday’s 2-0 win away at Sheriff Tiraspol was enjoyed and put us on the brink of qualifying for the knockout stages with three games left to play, I have no real opinion about the unrecognized Republic of Transnistria, so beating their main club is not as satisfying as it would be to have taken three points from the Gunners. Despite the derby failings, there are definite signs of progress for Spurs, but it is crucial they do not slip up following a lengthy European journey – as they did against West Ham, which followed the trip to Moscow to play Anzhi – when they face Hull in the Premiership this Sunday. As a quirk of the fixture list – and this is something that tends to happen often for some reason – but the next game for Tottenham after that will also be at home against Hull, in the League Cup next Wednesday. This Waffles vs Tigers doubleheader reminds me of a five match battle (two legs of the League Cup semi-final; an FA Cup tie and replay; plus one in the Premiership) with Wimbledon that we had over a three-week spell back in 1999, which culminated in Ben Thatcher, who had been run ragged by David Ginola in several games, being sent off for a wild lunge at Alan Nielsen, a performance which for some reason convinced then manager, George Graham, to pay £5m for the mediocre defender the following year. The big match in the Premiership this weekend is of course Chelsea facing Manchester City, as the richest clubs in the country face off against each other, both of whom are returning from midweek Champions League away fixtures. City had the longer trip and harder match, as they came back from Moscow with a 2-1 win over CSKA, but the game was marred by their black players facing racial abuse from sections of the home crowd; while Chelsea enjoyed a 3-0 victory in Germany against Schalke, with Fernando Torres scoring two of the goals. Manchester United – who won their Champions League fixture 1-0 against Real Sociedad on Wednesday, thanks to a first minute own goal – have a home match against Stoke; and Arsenal, who suffered a 2-1 defeat against the impressive Borussia Dortmund, take a trip across London to face the managerless Crystal Palace. Elsewhere, Southampton will try to keep up their impressive start to the season when they host Fulham; Liverpool face a team that beat them twice last season, West Brom; struggling Norwich entertain Cardiff; West Ham are in South Wales to play Swansea; there is the Tyne-Wear derby between Sunderland and Newcastle; while Aston Villa and Everton meet at Villa Park. In the other League Cup games during the week, Arsenal and Chelsea face off at the Emirates; there is an all claret-and-blue clash of Bunrley and West Ham; Manchester City travel to Newcastle; Leicester host Fulham; and there is a Midlands derby between Birmingham and Stoke.